Microsoft has looked into the whole workers-threatening-suicide thing and has determined it wasn't a working conditions issue. As we reported earlier in the week, over 300 employees at a Xbox 360 manufacturing plant owned by electronics giant, Foxconn, threatened mass suicide over a pay dispute. Microsoft promised to look into the matter and, as of yesterday, has completed an independent investigation of the issue. Microsoft is one of many companies that contracts with Foxconn to manufacture hardware. Upon learning of the labor protest in Wuhan, we immediately conducted an independent investigation of this issue. After talking with workers and management, it is our understanding that the worker protest was related to staffing assignments and transfer policies, not working conditions. 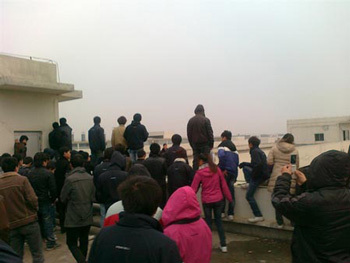 Due to regular production adjustments, Foxconn offered the workers the option of being transferred to alternative production lines or resigning and receiving all salary and bonuses due, according to length of service. After the protest, the majority of workers chose to return to work. A smaller portion of those employees elected to resign. Microsoft takes working conditions in the factories that manufacture its products very seriously. We have a stringent Vendor Code of Conduct that spells out our expectations, and we monitor working conditions closely on an ongoing basis and address issues as they emerge. Microsoft is committed to the fair treatment and safety of workers employed by our vendors and to ensuring conformance with Microsoft policy. Microsoft's statement is somewhat vague but does seem to contradict earlier reports that the suicide threats were a response to Foxconn reneging on a compensation agreement. Previously, Foxconn has been accused of providing poor working conditions, enforcing long working hours and allowing its security guards to abuse employees. In 2010, a spate of worker suicides made the international headlines and eventually even the Chinese government raised one of its state-ran eyebrows and told Foxconn to get its act together. The company ended up promising its workers a 20% pay rise.